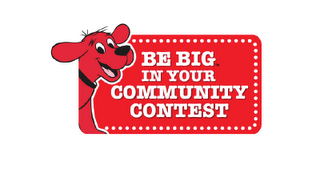 Scholastic Inc. has launched “The Be Big in Your Community Contest” in support of CLIFFORD THE BIG RED DOG® and the BE BIG™ initiative. The contest calls upon kids, parents, teachers, and community leaders to submit their BIG ideas for creating positive change in their communities by demonstrating Clifford’s Big Ideas; Share, Play Fair, Have Respect, Work Together, Be Responsible, Be A Good Friend, Help Others, Be Truthful, Be Kind and Believe In Yourself. The BE BIG Fund will help bring the winning BIG idea to life by awarding one (1) Grand Prize $25,000 community grant and ten (10) runner-up $2,500 community grants to implement the winning BIG ideas via HandsOn Network local affiliate organizations. Submit your idea at www.scholastic.com/cliffordbebig. And remember....IT ONLY TAKES A LITTLE TO BE BIG! NO PURCHASE NECESSARY. Open to legal residents of the fifty (50) United States and the District of Columbia. Void where prohibited or restricted by law. Contest starts April 20, 2009 and ends on June 26, 2009. I love to see giving back to the community. Nice! I would like to see who wins!